Pair of Mid-Century Modern rosewood or walnut armchairs having both been Reupholstered and fully Refinished in the style of Gio Ponti. These simply sleek and stylish chairs depict the Mid-Century Modern craze it its finest form. One of six pairs purchased from a hotel in France this fine set has been recovered in a tweed form and the frames totally redone in a rosewood form. The set strong and sturdy with wood seat rests and slat backs. A pair of Louis XV style bergère armchairs. Each having a finely carved frame and clean floral pattern fabric with carved rosettes throughout. 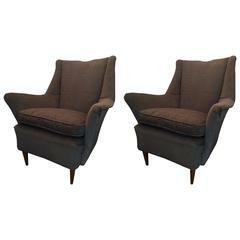 In the style of Gio Ponti Mid-Century pair of modern club chairs with notched out arms and deep seat cushion upholstered in linen. 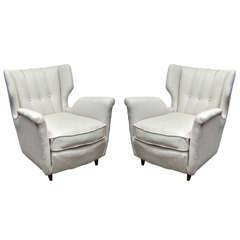 Pair of Italian linen Tufted armchairs in the style of Gio Ponti. Mid-Century Modern Gio Ponti manner armchair, walnut, restored, finished to wax. New upholstered with Wharol Haring fabric. Excellent conditions. Measures cm: H 85/48, W 57, D 53. 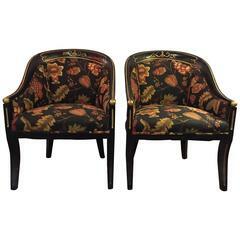 Pair of armchairs designed by Gio Ponti and made in Italy (ISA). Four Italian designed armchairs reupholstered in velvet mix on brass legs fantastic proportions in the Mid-Century design school style of Gio Ponti.